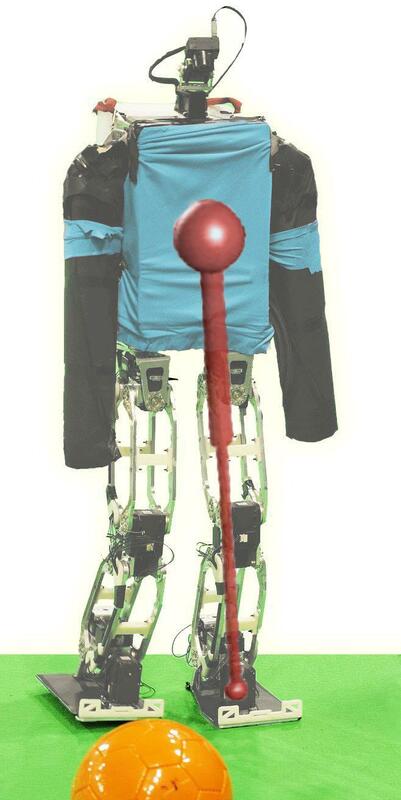 AcYut uses the 3D Linear Inverted Pendulum Model (3D-LIPM) to generate a walking pattern. In this model, the robot is approximated as a point mass placed at its centre of mass. The leg (assumed massless) connects the COM and the support point. The resulting equation takes the form of a linear combination of hyperbolic sines and cosines of the time variable. We indirectly control the robot's centre of mass by controlling the support leg. The free leg is governed by third or fourth degree polynomial equations, the coefficients of which are obtained by solving sets of linear equations based on states at some fixed instants. Once the desired coordinates of the centre of mass (equivalently, the support leg) are obtained as a function of time, they need to be translated into positions of AcYut’s motors. This technique is called inverse kinematics. Due to the structural design of AcYut and certain constraints imposed, there is a unique solution set of the positions of these motors in order to achieve a given coordinate set. Simple geometry can be used to arrive at the various angles, provided that the constraints are imposed (Example : The hip remains parallel to the ground).